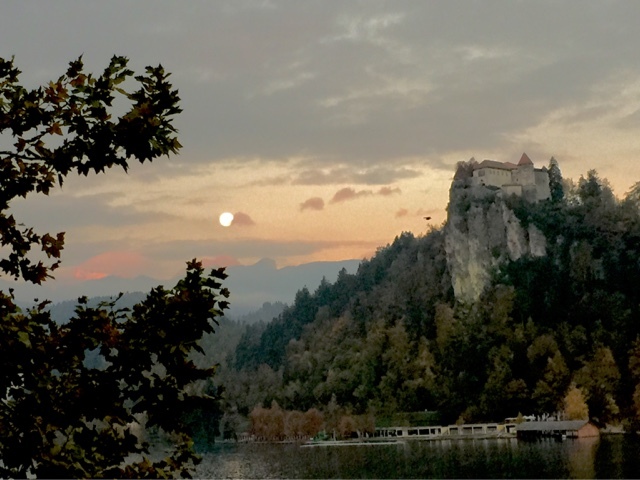 After a visit to a wine cellar of a small village in Bled, where we were entertained by two lively dancers dancing to a lyre-playing boy muse, and a hearty dinner of the famous Slovenian sausage, we returned to our hotel by the lake. The fairy-tale setting before me could have been a dream; it was surreal. I was lying in bed, staring at the brightly lit castle on top of the hill and its reflection on the water. Bled was like a fairy-tale setting where the center of it all was the lake. Oh wait, was it the island in the middle of the lake or the castle up on the hill? Oh well, I’ll let your imagination run wild in the mist covered hills, the lake's shining waters, the ducks and swans gliding in the water, small churches and gingerbread houses by the lake, the castle on top of the hill, the moon setting with the beautiful view of the Julian Alps in the backdrop, and the sounds of the church bells and birdsong captured in my video. Below the hill was a small church where its steeple also reflected on the water. Obviously, I was not dreaming because I was up at 3:00am Instagramming the pictures I took earlier. Then I fell asleep to this view. The following morning I walked around the lake and explored the castle on top of the hill. Somehow, the view from the castle was more interesting than the castle itself. I saw a 360-degree view of the lake, the island in the middle of the lake and a few hills with the Julian Alps in the backdrop. I also saw the Christmas village-like charm of the surrounding area. So I did not spend that much time in the museum or the wine cellar at the castle. Later, I took a boat ride to the island. There are two ways to get to the island. You either take a kayak or rent a boat and paddle to the island yourself or take a passenger boat that you share with nine other people. The flat bottom boat has a roof and a man rowing the boat with two oars. And that’s the thing I admire about the place. The town tries to maintain an eco-friendly resort by not allowing motorized boats on the lake. The boatman tried to get the boat filled to the max (10 people) before rowing. However, nobody else joined, so we went ahead with seven people. When we got to the island, I climbed ninety-nine steps to the main square and the tiny church. I found myself wandering alone inside the church. The others probably went their merry way, admiring the beautiful views of the blue lake and the Julian Alps all around us or went straight ahead and climbed the bell tower. The tiny church has an arch door that let the natural light highlight the golden décor and religious icons in the church. In the middle, just before the very ornate altar, was the rope that I pulled to ring the bell. According to the description posted on the doorway, excavations on the island have unearthed the remains of a IXth century chapel, XIIth Romanesque Basilica with three naves, Baroque Church and a Slavic graveyard. In 1951 the island was declared a cultural and historical monument. I then paid six euros to climb the Bell Tower. The golden motif continued through the Bell Tower with the staircase in honey-colored pine. The following morning I woke up to the sound of church bells and bird song and quack quack quacks. Then something far above the castle and the mountains caught my eye – a full moon. The moon was setting and slowly disappearing in the clouds. I took my camera to capture the awe-inspiring sight. But I got something more; the mist covered hills and the glimmer of the rising sun reflecting off the Julian Alps. It was magical! The moon slowly disappearing in the clouds.